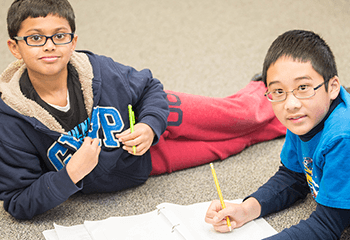 The Math Beasts Camp 7-9 summer program is designed for students who have just completed a Prealgebra or Algebra 1 equivalent math class, including our Prealgebra or Algebra 1 Academic Year courses. (Students are not required to take AoPS Academy Academic Year courses prior to enrolling in AoPS Academy summer programs.) We expect most students in Math Beasts Camp 7-9 to be in 7th, 8th, or 9th grade, along with some mathematically advanced younger students. Each day of Math Beasts Camp 7-9 consists of a Problem Solving component and a Mathematical Exploration component. Problem Solving keeps students sharp on particular topics while preparing them for the upcoming school year. We start each class with a quick review of a key topic that students should have encountered in the previous school year. This review is followed by a series of intriguing problems that push student understanding of the topic well beyond the standard classroom level. We finish each Problem Solving discussion with a challenging activity in which students collaborate in teams. Our Mathematical Explorations are designed to introduce topics that most students don't encounter until much later in their schooling, and to equip students with general mathematical strategies that will be useful throughout their education. The Math Beasts Camp 7-9 Mathematical Exploration is an introduction to cryptography. We start with Caesar Ciphers, Keyword Ciphers, and other techniques before introducing the building blocks of number theory that are the foundations of modern cryptography. Students will end the course with an appreciation for the cryptographic concepts that make security on the internet possible.